Jujhar Khaira is proof that not all hockey players blossom at the same time. Playing minor-midget hockey, the Cloverdale, B.C., native went undrafted by the Western Hockey League. However, a scout from the Prince George Spruce Kings of the British Columbia Hockey League saw something in him, and over the last two seasons, the relationship has been beneficial to both sides. In his second season with Prince George, Khaira -- a left wing who now measures in at 6-foot-2 and 182 pounds -- finished 10th in the BCHL with 79 points in 54 games. He also had 29 goals, including a team-best 10 on the power play. That production helped him earn the No. 74 spot in NHL Central Scouting's final ranking of North American skaters for the 2012 NHL Draft. "He was a big part of the success this year for his team," Central Scouting's B.J. MacDonald told NHL.com. "He logged tons of minutes and played on all special teams. An underrated playmaker. He handles and distributes the puck very well, [and] he's responsible at both ends of the rink. Good size and used it effectively in protecting puck and in the corners." Prince George GM Mike Hawes told NHL.com that Khaira's style of play reminded him of another Vancouver-area player -- Boston's Milan Lucic. "Jujhar is the guy that always leads on the forecheck," Hawes said. "He has the ability to knock defensemen off the puck and create scoring chances. Once he gets the puck, he's able to control it and fend guys off with his strength and power and get the puck to the net for opportunities." An opportunity is what Khaira was looking for after going unselected in the 2010 WHL draft. While disappointing, he said it wasn't unexpected. However, that slight wasn't going to push him out of the game he loves. "There's never been an option of quitting hockey," he told NHL.com. "I've always loved the game, always loved to play." That meant being a bit creative, and when an offer from Prince George came up, he jumped at the chance. 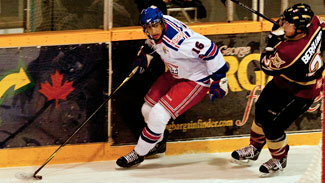 "It was the [BCHL] that gave me my first opportunity," Khaira said. "I wasn't signed with any junior B teams. No WHL teams came asking me to sign. I went to a BC junior camp for Prince George and they signed me out of there. It was my first option and it worked out really well." Hawes credited one of the club's Vancouver-area scouts for discovering Khaira and convincing the team to offer the youngster a camp invitation. "Our scouts in the Vancouver area had identified Jujhar as a guy who had slipped through the cracks," Hawes said. "He saw a late-bloomer with his minor hockey. He really didn't come into his own until the year before we brought him up. The scout in the area wanted to bring him to our camp as a 16-year old because he thought he could crack our roster as a 16-year-old. We brought him to camp and had a look at him. Within the first day of camp, we knew we had something special, that we couldn't let him go, so we got him all signed onto our roster. He had a terrific year as a 16-year-old and an even better year last year. "Jujhar is the guy that always leads on the forecheck. He has the ability to knock defensemen off the puck and create scoring chances. Once he gets the puck, he's able to control it and fend guys off with his strength and power and get the puck to the net for opportunities." "To be honest, it kind of clicked for him the few months prior to him coming to camp with us. I think at the tail end of his first year of midget hockey in Surrey, he kind of came into his own the last couple months and that's what drew our scout's attention. For that reason he wanted to bring him to camp. Over that summer he put on a lot of strength, and for that reason was able to come into camp and really knock our socks off. We didn't anticipate seeing what we saw in him." Khaira was excited to find a team that wanted him, even if that team was a 10-hour drive north. "After I signed, my mom and dad were hesitant of taking me up there," Khaira said. "I was just happy to be [signed]. I don't think I slept for a week that week. After that, seeing how excited I was, they felt more confident with me up there." After the draft, Khaira is committed to play next season at Michigan Tech. The Everett Silvertips own his WHL rights, but Khaira said right now his first choice is to go the NCAA route. Our [former] coach [Ed Dempsey], he's an alum and had a lot of great things to say," Khaira said. "Just talking to the coaching staff there, they said I'd be a main building block for the program. They were offering a lot of playing time in key situations. That was the main thing that sold me." Wherever Khaira ends up, he'll likely be the only player of Punjabi decent on the team. His parents immigrated to Canada when each was young, but Khaira is a first-generation Canadian. And while his parents grew up enveloped in the Canadian hockey culture, other family members aren't as familiar with the game. His father's parents live in Canada now, but Khaira said their understanding of the game for a few years was limited to cheering for the same team their grandson is playing for. Now, he said, they get the game a bit more. "They understand," he said. "There was a game where I got into a fight and my grandpa was there and he was trying to give me pointers and stuff. That was funny."